A small town named Gonda in UP was at the last position among 434 cities surveyed across the country. It shall also be remembered that Gonda district is among the 10 districts in UP severely affected by Encephalitis. All this means that hygiene is one of the crucial factors in containing encephalitis, and the total failure of administration in this problem has lead to this terrible situation. CM, busy with spitting communal venom over Ram Mandir, Shamshan-Khabaristan and so on right. The condition of health sector in your constituency is unmasked by the fact that there is only one hospital which has now become frighteningly overcrowded. It seems that the whole governance system, civil and legal profession as also the so called democratic countries are bent upon killing the human and other life forms on earth with no corrective action in sight. This primarily affects the poor. We should do much better in public health. There is a rule that every doctor must do two years’ rural service but most are not willing and try to evade it. They get some political influence and escape it. Others prefer to go abroad. It is easy to be critical but the reality of public health here is something that cannot be even imagined. It is caught up in the politics of corrupt bureaucracy and government. The health system needs healthcare professionals, increase in literacy, people aware of their rights, organisations to fight against injustice to deliver and successful vaccination campaigns need committed health workers. Yogi was MP of Gorakhpur for more than two decades and his mentor was the boss before and Gorakhpur is fiefdom of his mutt since independence and no other party, individual can do anything over there. He terrorised that area for decades and prevented any christian organisation from establishing schools, hospitals, nursing colleges and is mainly responsible for the poor illiteracy in that area. He is against rationalism and right to choose God on choice. He is a fanatic supporter of superstitions and making him a good samaritan who is sincere is a big lie. He and his mutt actively encourages superstitions and keeps the locals illiterate for decades.He is against women education, women reservation bill, women in jobs and you praise him as sincere. He and his mutt should share the maximum blame for the state of Gorakhpur. A big issue which I think the news stories are not picking up is that the supply chain systems in government hospitals across the country are steeped in corruption. While the Yogi government surely shares responsibility for the death of those children, let us not miss the fact that the hospital has been falling behind on its dues for the last couple of years and simply stopped the payments for more than one year. There is a bigger share responsibility on the Samajwadi government that was in power. Statement by the hospital says only 5 of the 30 children who died on 10th and 11th August suffered from Acute Encephalitis Syndrome, and that 17 of them were in the neonatal ICU. 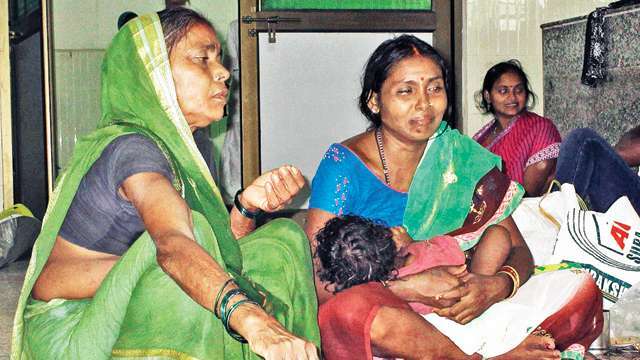 Neonatal ICU is where the newborn are admitted and oxygen delivered to them, which means that 17 deaths had most probably happened due to lack of oxygen supply, thereby disproving the state government’s version implying that there is no callousness over non-clearance of mere 68 lakh dues to Lucknow-based Pushpa sales. UP and Bihar are little more than a series of tragedies, no matter which government comes to power in the state. And they are deliberately kept in a state of perpetual decay leaving more than 300 million to do nothing but live, rot and die. This incident highlights the pathetic state of health care in the country once again. Despite many activists and voluntary organisations repeatedly appealing for improvement in medical aid, the governments have been deaf to the appeals and there are no concrete measures being initiated.